CVs are similar between individuals. 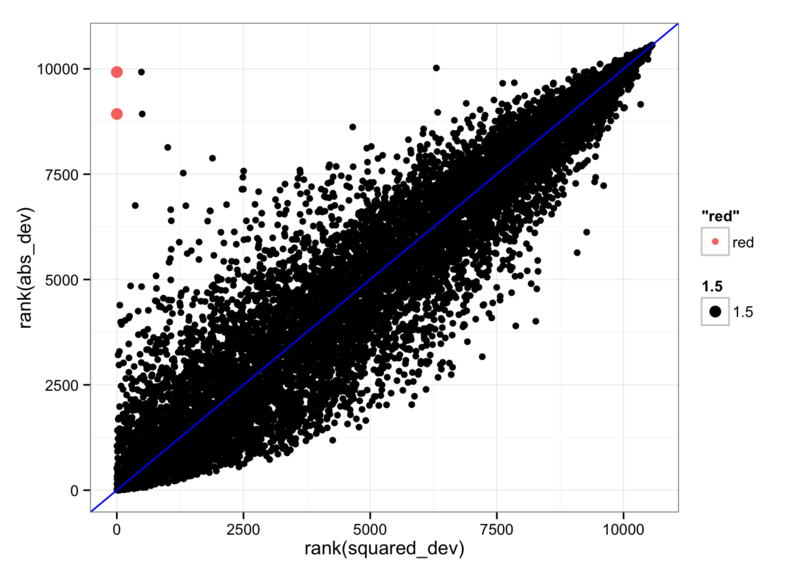 The distributions of the adjusted squared CVs are not the same in their medians. This may cause an unfair comparison of the adj. CV^2 scores between individuals. We normlized the log10 adj. 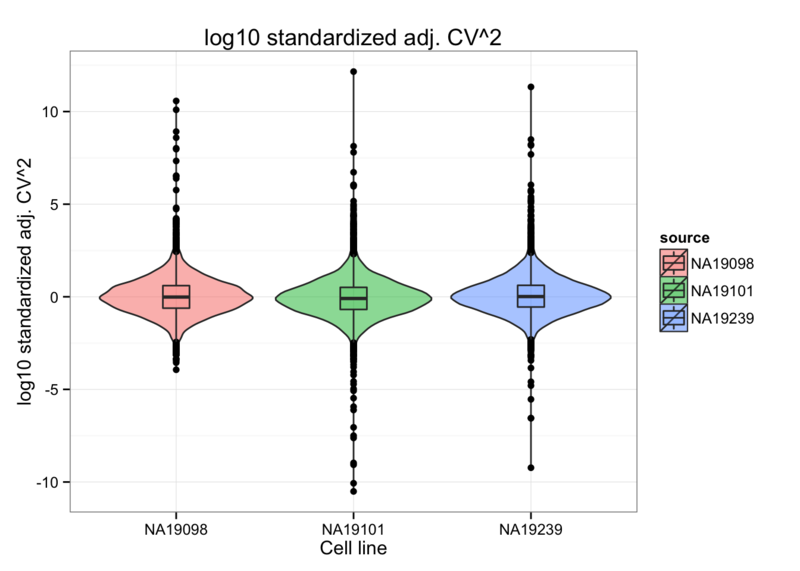 CV^2 by standardizing indivdual CVs over the mean and standard deviation across genes. 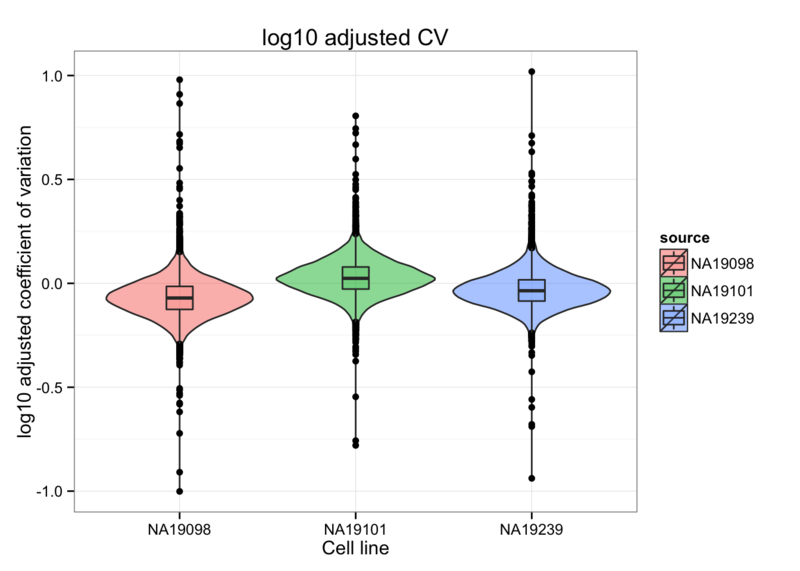 Note the change in CV distribution from log10 adj CV^2 to normalized log10 adj CV^2. After accounting for differences in variability of the log10 adj. 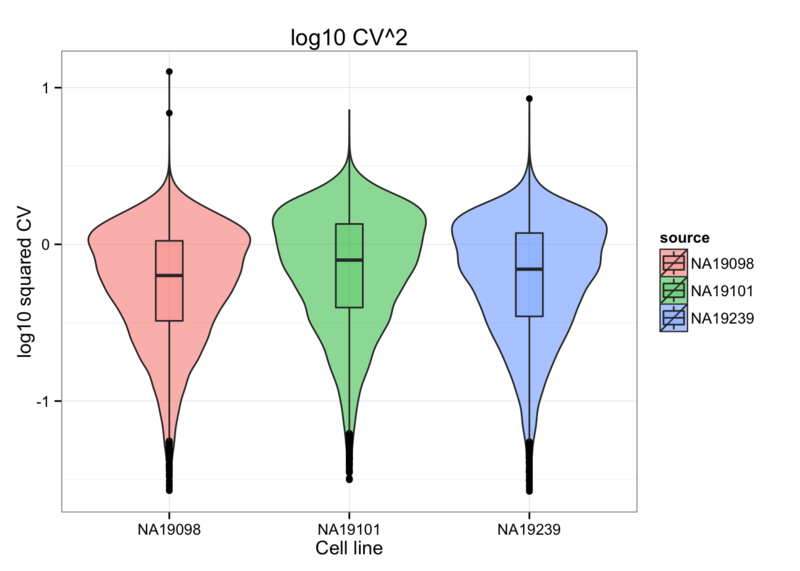 CV62, we observed that NA19098 spans an obviously smaller range of normalized adj CV^2 values than the other two cell lines, probably a consequence of the small number of cells in NA19098 (n = 141) compared to the others (NA19101: 201 cells; NA19239: 225 cells). 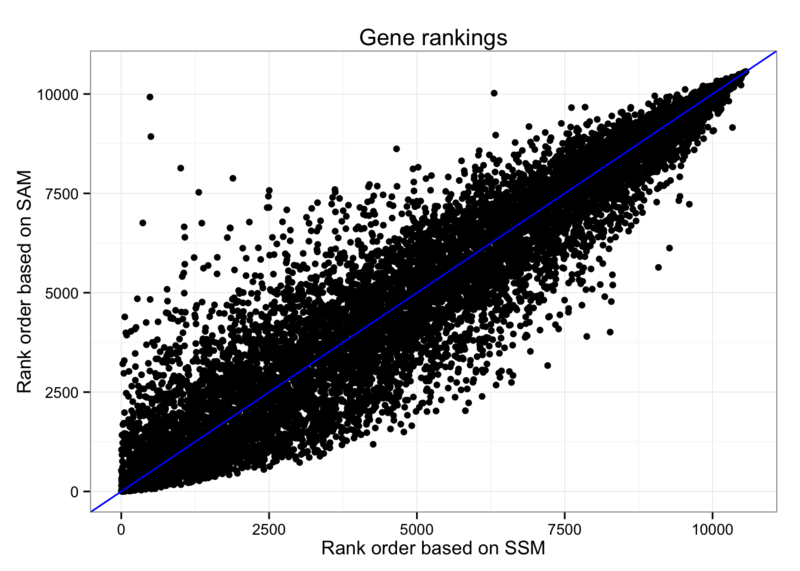 Gene rankings based on SSM (Sum-of-Squared-Deviation-from-the-Median) and SAM (Sum-of-Absolute-Deviation-from-the-Median). 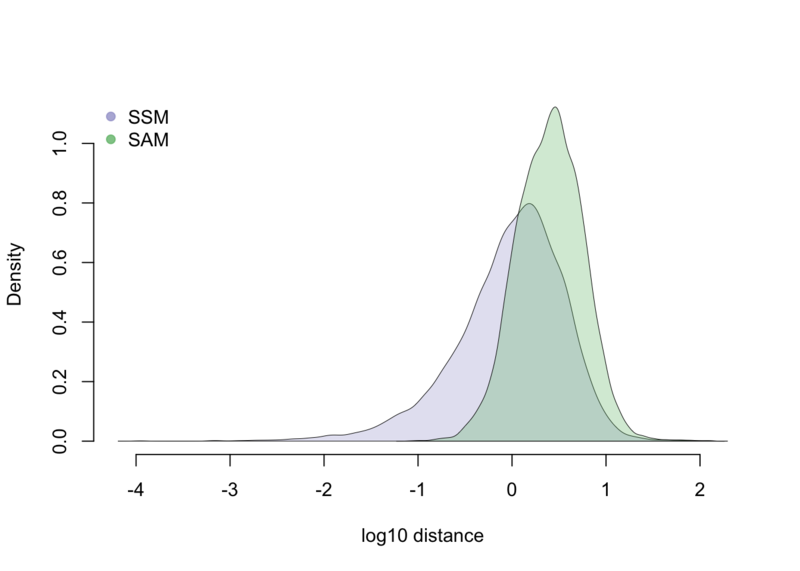 *Look at the gene with low ranking in SSM (small difference) but high ranking in SAM (large difference). Print out CV values. Recall that these are standardized values (z-scores); hence, vlaues outside of mean +/- standard deviation are quite large. Ranks of the three individuals are consistent for the three genes selected here.